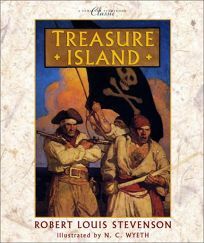 The Scribner Storybook Classic line adds Robert Louis Stevenson's Treasure Island, abridged by Timothy Meis, with vintage illustrations by N.C. Wyeth. Young Jim Hawkins finds a treasure map and follows it to South America, only to wind up in the hands of the notorious pirate Long John Silver. Climactic scenes of aggressive mutineers or the hero's valiant attempt to keep the evil Mr. Hands at bay come alive in Wyeth's atmospheric oil paintings.